Rahul Industries offers Graphite Rings which are manufactured using high-grade material imported from the most credible sources. We offer our customers a broad range of Carbon Graphite Rings, which are available in various sizes and specifications. Carbon Graphite Rings are available for mechanical seals. 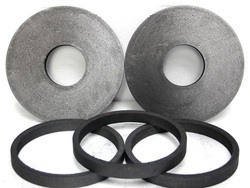 We offer Carbon Graphite Rings in various sizes and designs and with close dimensional tolerance for use as an integral part of mechanical seals. Looking for Graphite Rings ?